The plaintive sound of the flute is no stranger to the traditional Dojo or "Place of the Way", nor is the solemnity of a Black Belt presentation ceremony. The inspiring words of the Master directing the hearts and minds of the aspirants to their highest essence is also part of the tradition of an Art named: Harmony/Coming to Meet - [Ai], Spirit/Energy - [Ki or Chi], Path/Way - [Dooh], Aikido! For all the familiar elements of this martial way arising out of the Japanese tradition, those who were privileged to attend this Black Belt presentation ceremony witnessed a most unusual, perhaps even a unique event. On this occasion, Aikido was combined with the vitalizing 'Ki' of the Path of the Sufis. In essence there is nothing new or unfamiliar to Aikido, yet it is both new and a blessed renewal. In this ceremony Aikido was granted an increase in its life energy and re-ignited with the fire of the Sufis. complaining of the pain of separation"
The Masters voice, speaking of Chi, Essence and the Way to Unity is the voice of our beloved Murshid F.A. Ali ElSenossi. Haqq, Haqq, Haqq, Hu, Hu, Hu, Hu, Hu, Hu, Huuuuuuuuuuuuuuuuuuuuuuuuuu! Then the Oath of Allegiance was taken by the new Dan grades - three 1st Dans, one 2nd Dan, one 7th Dan and one Honourary 10th Dan, graciously accepted by our Spiritual Guide, Murshid F. A. Ali ElSenossi, who then spoke, Alhamdulillah! 3) In the spirit and this is where the real illumination occurs and the real Human Being is to be found. Those in the first two categories do not have even a whiff of Real Knowledge of the Absolute. If one does not make efforts to strive towards that which is Real, this is a situation that could last for one's entire life. In Unity Aikido, we try to harness and develop the 'two fives'. The first are the five senses, which are the windows to the outward or material world - that which we witness with our physical eyes. The second five are the subtle centres of our being, which are called 'Lata'if'. If these subtle centres are developed by way of the accurate method and harmony, awareness and love, they will integrate to the Unity of the One. As the Aikido grading changes colour with every stage, so too do the Lata'if. When we master and control the physical body we learn about the 'Chi,' or Essence, and this occurs through the five outdoor windows and the mind. When we become practitioners in the Inward Method of Unity, we unlock the Essence of the subtle centres in sequence, the first of which is the Heart and the colour related to this is blue. The second latifah is the Spirit, whose colour is yellow. The third is the Secret, whose colour is red; the fourth is the Secret of the Secret, whose colour is white. The fifth latifah is called 'the Knowledge of the Supreme Being', and its colour is green, that is of compassion and love. If you develop any of these, you will truly experience the Higher Power of the Chi. Then you will say with a smile on your face, I am for the Eternal Beauty. What the Real beauty is, is the Reality of Unity and integration which manifests itself in every moment and which is never absent. Aikido's path to this point has been a long one. Aiki-do arose from the rich martial heritage of Japan. It is a form derived from Jujutsu or soft/flexible art for both unarmed and armed combat. "The inception of Jujutsu is recorded in the Kojiki [Record of Ancient Matters] and the Nihon Shoki [Chronicles of Japan] compiled at the beginning of the eighth century". among any people, at any time. Every move is the outcome of the experience and contemplation of ancient masters. In them is naturally fused, unified and embodied the Oriental spirit as seen in Confucianism, Buddhism and the Teachings of Lao-tse and Chuang-tse. The Eightfold Path of Buddhism: Right belief, resolve, speech, behaviour, occupation, effort, contemplation, and concentration. On hearing of the Way the best of men will earnestly explore its length. The mediocre person learns of it and takes it up and sets it down. But vulgar people when they hear the news will laugh out loud. And if they did not laugh it would not be the Way. Aiki had its beginnings in 11th century Japan when General Yoshimitzu Minamoto, a soldier, poet and physician taught the form to his fighting men for their inner strength and development. "According to the Den-Sho [manuscripts of instruction and records of the secrets of the martial arts], the aiki jujitsu dates as far back as the Kamakura period [1185-1336]. It was founded by Yoshimitsu Minamoto [d. 1120] and handed down in the Minamoto family for generations, and then was taken over by the Takeda family of the Aizu clan. After seven generations the legitimate inheritor of the art is Moritaka Ueyshiba." The original Aiki was a fighting art as in Aikijutsu. 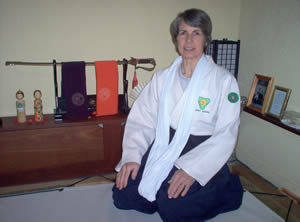 The 'Do' or 'Way' form arose from the school developed by Uyeshiba Sensei and it has spread widely in the West. His five main inheritors have further developed Aikido and it has diversified into their various schools. "More than thirty different sects of aiki-do exist today" [In Japan]. 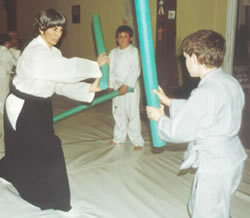 Some are Aiki-jutsu or 'art ' forms from the early forms, some Aiki-do, or spiritual path forms. The first school of Ai-ki to develop Aikido as a sport was founded by the late Professor Kenji Tomiki. He was professor of Physical Education at Tokyo's Waseda University, a master of Judo and Aikido and a direct student of both Master Jigoro Kano who founded Judo and Uyeshiba Sensei. His style, which he called Aikido Kyogi or Sports Aikido was established under the auspices of the Waseda University Sports Department. Tomiki Sensei utilized the grading structure and fundamental principles of Judo as developed by Kano Sensei. He rationalized the Aikido forms of Uyeshiba Sensei so they could be more efficiently taught in schools and universities. Tomiki Sensei spread his style throughout Japan particularly in universities with Aikido sport competitions gaining in popularity. His Aikido spread internationally to Europe, the U.K. North and South America, South East Asia, and Australia through his own visits to the U.S. in 1953 and Australia in 1977and via his senior students. International competitions and demonstrations are held bi-annually. At the first international competition held in Australia in 1999, Sensei Hanifa of Unity Aikido gave the keynote speech as the founder of the first Tomiki style Aikido organization in Australia. By 1966 Tomiki Aikido was being taught in London at several dojos. Sensei Hanifa, a Melbourne born graphic artist, went to the U.K. to further her career and studied Aikido at the Lambeth Dojo. She had asked her Creator for a spiritual purpose in life as a young teenager and was about to take a most important step towards it. She had wanted to study martial arts since first practicing from a book with school friends. Without a teacher the practice soon ended but not the desire to acquire such skill. This desire was further reinforced when she faced life-threatening encounters on two occasions and by a visit to Japan with her Godparents where she watched elderly, yet most 'genki' [or full of life ki] Judo players at the Kodokan, the home of Judo in Tokyo. When she gained a 1st degree black belt and after receiving special teacher training she returned to Australia in 1968 at the invitation of Judo Sensei Frank Dando. 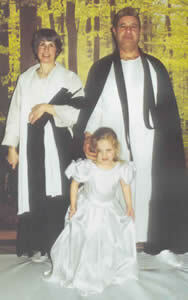 She started Aikido classes at his Ashwood Dojo in Melbourne. In 1970 during the visit of her UK Aikido teacher John Gay and his assistant Eric Dadey, the Australian Aikido Association (AAA) was formed. 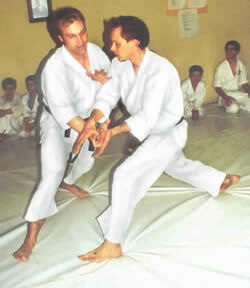 Since then much of the spread of Aikido throughout Australia has been via its students and their students in turn. Many have formed their own organizations while maintaining ties with Japan. 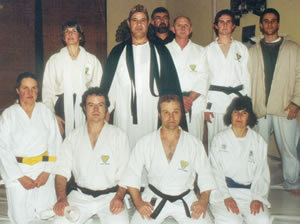 In 1977 Tomiki Sensei visited Australia with his wife and assistant Fumiyaki Shishida. They were guests in Hanifa's home and Tomiki Sensei gave unstintingly of his knowledge and inspired them by his gentlemanly example at all times. That visit and the subsequent visits of next Japan Aikido Association (JAA) headmaster, Ohba Sensei and other Aikido teachers and friends, were the highlights of those years along with four Aikido study trips to Japan, on two occasions traveling with groups of students. Through Aikido contacts Hanifa was introduced to a member of the Japanese Imperial family, who became her spiritual mentor until she passed away. Tomiki Sensei passed away in 1979 and on his deathbed told his wife he was going to Australia. From that time on Hanifa felt his inspiration guiding her in her teaching. After many years service she resigned from the AAA and formed her own school, The Aikido School of Melbourne where she could work in the manner she was being guided towards. Another invitation to Japan presented the opportunity to study the wider syllabus of Tomiki Aikido before the focus was narrowed to that of mainly competition sport. This knowledge was then incorporated into her teaching back in Australia. She and her husband relocated to Tasmania in 1995 after meeting Murshid Ali at the Rainbow Festival in Salamanca Place, Hobart. The blessing of sitting in the presence of a highly spiritual man drew Hanifa to embrace Islam. The more she heard of the higher Islam the more she realized it was what she had been seeking all along in Aikido and other traditions such as the Native American Indian Tradition which she had studied for the previous four years. She found that Sufism was in fact, true Aikido, true Budo [warriors Way] and contained all the answers and the method of return to Unity. When she embraced Islam the Muslim name of Hanifa was given to her by Murshid Ali. He described Aikido as a good foundation for spiritual growth. Studying Aikido from the Sufi perspective has helped to unfold more and more of its technical and spiritual essence. With the blessing of her Murshid, a new Aikido club at Port Huon, Tasmania was opened. It was to carry the name 'Unity Aikido', to reflect the harmony and peace that following 'The Way' should bring. We were greatly honoured by the attendance of Murshid Ali and his family at the opening ceremony. Classes at Unity Aikido cater for both fit and unfit adults, teenagers and children from 5 years upwards. They all practice Aikido as is appropriate for their growth and it is informed by the Samurai ethic which has such close parallels with Futuwwah, the Islamic code of chivalry. On the twenty third of April 2005 at the first Second Dan grading in Unity Aikido, Sensei Hanifa read out the founding document of Unity Aikido, which promulgated Unity Aikido as an independent system of Aikido. After 40 years in Aikido, being a direct student of Tomiki Sensei and other masters, with a wide teaching and studying career in these traditions, Sensei Hanifa took on the rights and responsibilities of 7th Dan to enable the new organization to have a complete technical system and grading structure. Murshid F.A. Ali ElSenossi graciously accepted the honourary position of 10th Dan and Spiritual Guide to Unity Aikido. The ceremony marking the presentation of the Black Belts and the taking of the Oath of Allegiance by the Dan Grades marks an important new development in the history of Aikido. It is a renewal of the spiritual energy or 'Ki' of Aikido, which has become dissipated over time - the present focus in Japan and elsewhere being mainly on sport and fitness. We give thanks to Allah for this renewal and we trust it will bring benefit to all concerned. We are honoured beyond measure to have our Murshid as the Spiritual Guide of Unity Aikido and may Allah be pleased with him and with all the Mashayakh of the Tariqa. and Love to Ourselves, to all others and God willing, to all Creation.